INDIANAPOLIS, Ind. (September 30, 2017, Credit scca.com.) 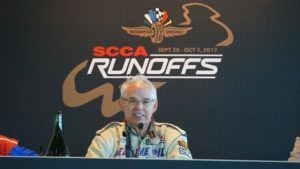 – It was an all Canadian front row in the GT-3 race Saturday morning during the SCCA® National Championship Runoffs® at Indianapolis Motor Speedway. Collin Jackson, of Langley, British Columbian, and Joe Kristensen, of London, Ontario, were side by side when the green flag waved. As it turns out, that was the closest the battle for the win would be in the GT-3 event as Jackson, driving the No. 53 Specialty Engineering/BM&M Screen Nissan 240-SX, stormed off to what would be a 51-second victory. That gives Jackson four wins in four Runoffs appearances. It didn’t really come as a surprise that Jackson was so hot Saturday. He held the top times all four days of qualifying and said the car actually came off the trailer perfect for testing last week at Indianapolis. Behind Jackson, there was a vigorous struggle for the remaining podium positions. Kristensen, in the No. 14 Kristensen Racing Engines Acura RSX, had car troubles and fell out of the hunt. Jeff Dernehl, in the No. 71 Roswell Outback/RRE/Hoosier/Roux Mazda RX-7, inherited the second spot, but behind him the No. 41 Mazda/Hoosier/Mobil 1 Mazda RX-7 of Stacy Wilson and the No. 15 Toyota/TRD Toyota Paseo of Wolfgang Maike were closing in. Maike got by Wilson working lap 12 and closed in on Dernehl. But Maike’s car seemed to fade, and Wilson got past. Then he put the pressure on Dernehl, but it wasn’t enough. After 19 laps, Dernehl held tight to claim the second spot on the podium. Wilson, the defending Runoffs champion, brought his car home in the third position. Maike kept it together to finish fourth, and Rob Warkocki, in the No. 78 Hoosier/MazdaMotorsport/TRO Mazda RX-7, finished fifth. The Sunoco Hard Charger award went to John Mills in the No. 122 Racer Parts Wholesale Mazda Miata who started 12th and finished sixth. INDIANAPOLIS, Ind. — Provisional results for Saturday’s GT-3 race at the 54th SCCA National Championship Runoffs from Indianapolis Motor Speedway, with finish position, starting position in parentheses, driver, hometown, car and laps complete. 1, (1), Collin Jackson, Langley, BC, Nissan 240-SX, 19. 2, (3), Jeff Dernehl, Roswell, GA, Mazda RX-7, 19. 3, (5), Stacy Wilson, Englewood, TN, Mazda RX-7, 19. 4, (6), Wolfgang Maike, Santa Barbara, CA, Toyota Paseo, 19. 5, (4), Rob Warkocki, Frankfort, IL, Mazda RX-7, 19. 6, (12), John Mills, Fostoria, OH, Mazda Miata, 19. 7, (11), Jeffrey Barrow, Acton, CA, Acura RSX, 18. 8, (13), Ken Nelson, Novi, MI, Nissan 200-SX, 18. 9, (9), James Ashe, Prospect, CT, Mazda RX-7, 18. 10, (15), Ray Stephenson, Miami, FL, Mazda RX-7, 18. 11, (16), Sam Moore, Kannapolis, NC, Volvo 1800 S, 17. 12, (10), Bill McGavic, Arcadia, FL, Mazda RX-7, 16. 13, (17), George Walker, Tulsa, OK, Mazda Miata, 16. 14, (2), Joe Kristensen, London, ONT, Acura RSX, 5. 15, (7), Chad Bacon, Mooresville, NC, Toyota Celica, 1. 16, (8), Paul Young, Commerce Township, MI, Ford Probe, 0. DNS, (14), Rick Ricker, Waterford, VA, Toyota Celica.